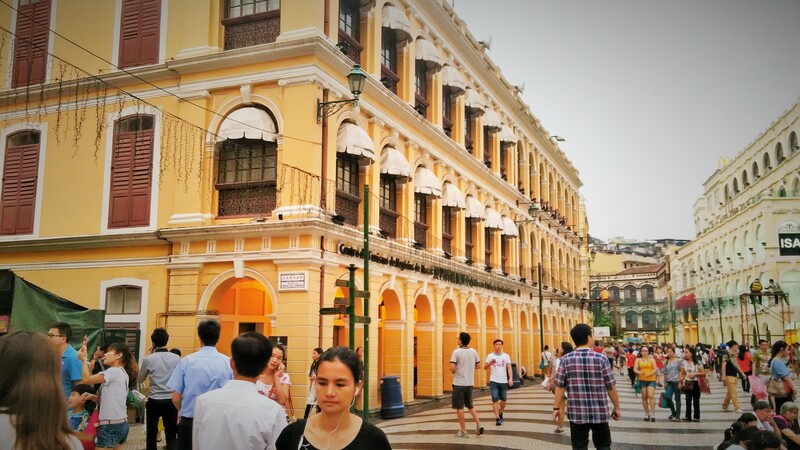 They say: If you haven’t been to Senado Square, you haven’t been to Macau! It’s named after the Leal Senado Building and has been Macau’s urban centre for centuries. It is a lovely place to simply relax, may be, have cup of coffee or an ice-cream and take photographs. It is also a shopping and eating hub with numerous bylanes selling different things like souvenirs, clothes, cosmetics and local food items. The square is paved with beautiful Portuguese cobblestones and surrounded by pastel-coloured neo-classical buildings, creating a very European feel. All in all, this place is a splendid blend of Chinese and Portuguese cultural traits. Senado Square is at a walking distance from Ruins of St Pauls. 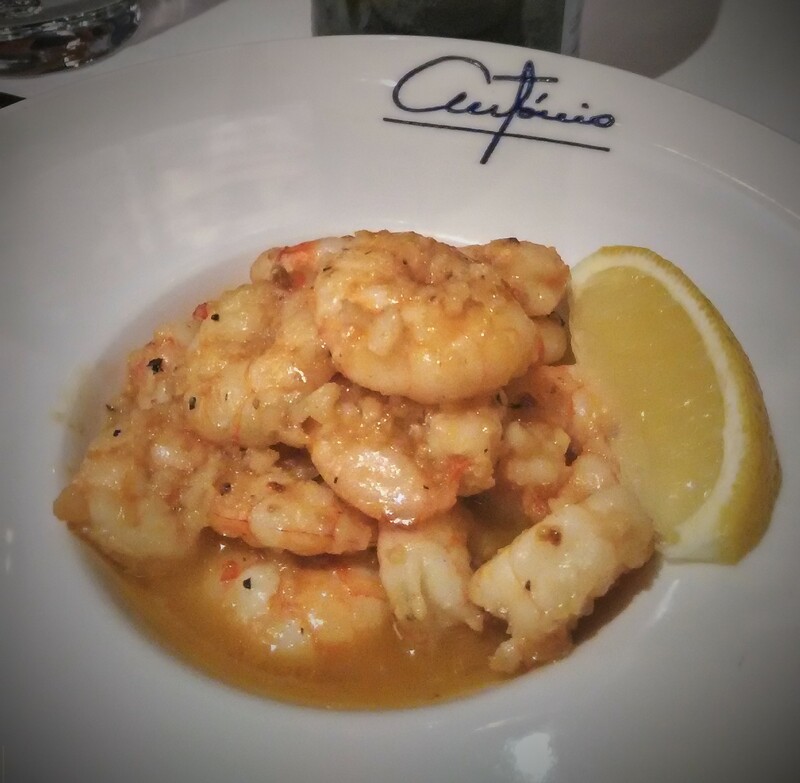 If you’re looking for something more than just a delicious meal, Antonio is the place to go. 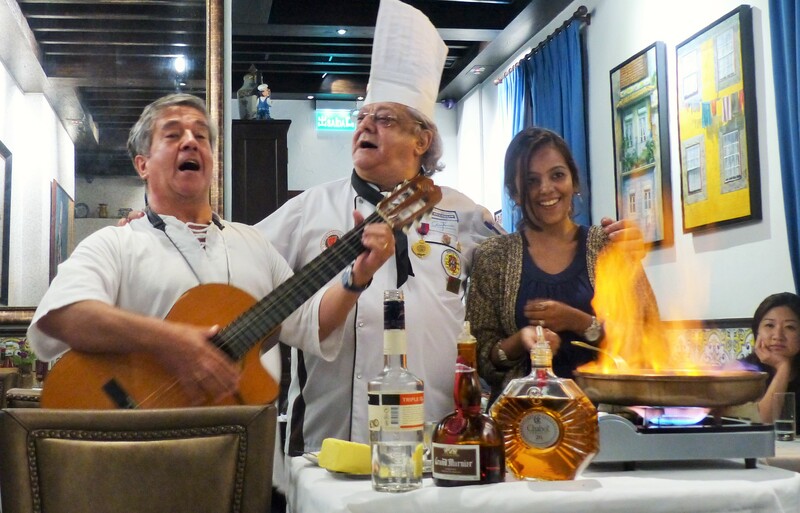 It is a cute little restaurant situated in the heart of Old Taipa Village and serves authentic Portuguese cuisine. Even reaching this joint is an experience in itself. You will find yourself meandering your way down the lovely, narrow paved streets of this old Portuguese village, lined with colourful colonial houses complete with tiny little balconies. Though it’s a stone’s throw away from the hub of casinos, it’s a completely different world altogether because of its old world charm. Michelin-star chef and founder of the restaurant, Antonio is a man loaded with talent. To see him cooking live equals to viewing a performance. You will see him singing, dancing and smiling while working his magic with the dishes. His sautéed clams, African chicken, Portuguese duck rice and orange zest crepes are a must-try. Don’t forget to pair these with your favourite Portuguese wine. What’s more? If you’re lucky enough, you get to dine with a Portuguese singer humming soothing music in the background to elevate the whole eating experience. When you know that a show is worth HKD 2 billion, you know it’s going to be spectacular, extravagant and something you may have never seen before. The water-based show is truly ethereal and draws creative inspiration from the Chinese culture. The House of Dancing Water portrays an epic love story that transcends time and space. You’ll be stunned by the grandeur of the sets and the physical performances by the artistes as it’s all done with a lot of expertise, agility and wit. All in all, its mesmerizing audio visuals will take you on an awe-inspiring journey through the heights and depths of human emotions. 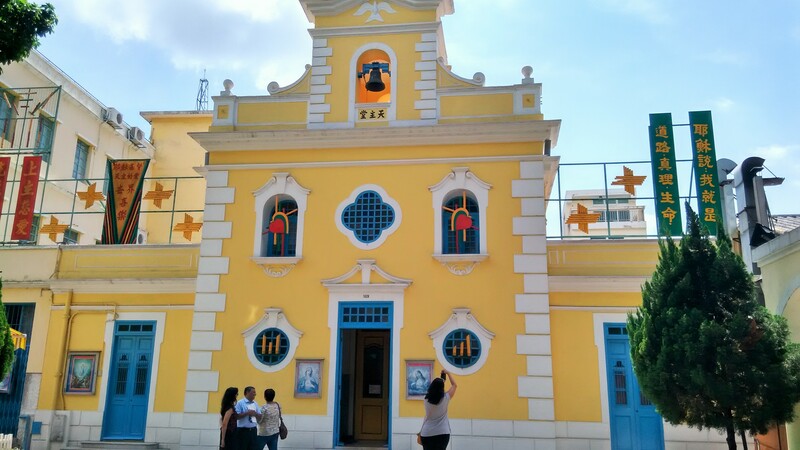 Take a stroll through the narrow streets of this sleepy village and feel the atmosphere of traditional Macau. This is a place where stones still speak of the age of pirates, old grey bricked houses, temples and ancestral trades using ancient techniques. The alley along the riverside is a spot full of history. Observe the peaceful way of life enjoyed by the inhabitants, admire their houses built on piles over water and relax by the pier. If you’re hungry, you can drop in at the popular Lord Stow’s Bakery & Cafe. 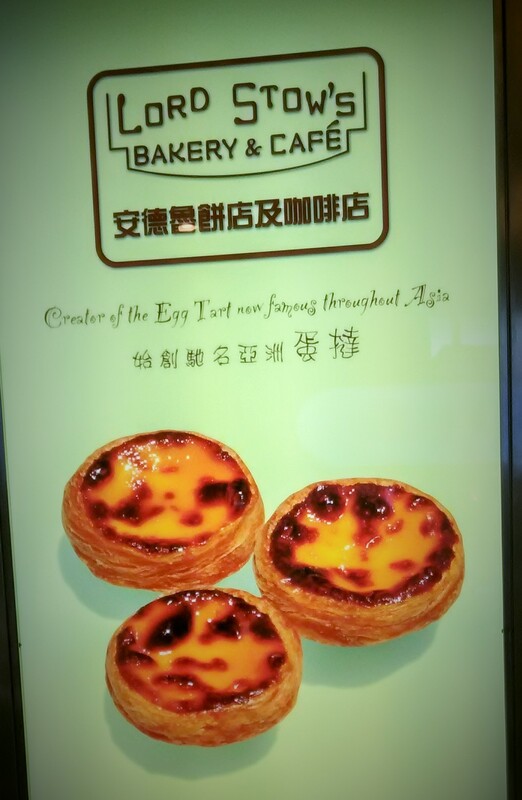 Portuguese egg tarts with their warm, buttery crust and satin egg filling are definitely a must-have. 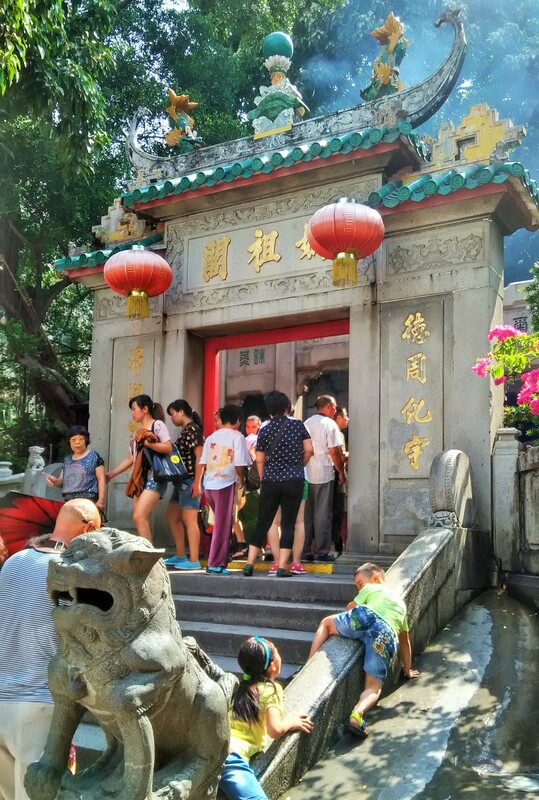 If you’re someone who loves visiting the temples to soak in the culture of a place, a visit to the A-Ma Temple in Macau is a must. Thousands of locals visit the temple every day. It was probably already standing when the Portuguese arrived, although the present structure may date back to the 16th century. The name “Macau” is believed to derive from the Chinese “A-Ma-Gau” meaning “Bay of the sea goddess”, on which A-Ma Temple is located. It was here that fisherfolk once came to replenish supplies and pray for fair weather. A-Ma consists of prayer pavilions on four levels, set into the hill that rises from the waterfront of the inner harbour. The temple has been a very popular subject for artists including George Chinnery and Auguste Borget over the centuries. Get inspired by thrill seeker AJ Hackett, who made headlines in 1987 by jumping off the Eiffel Tower! 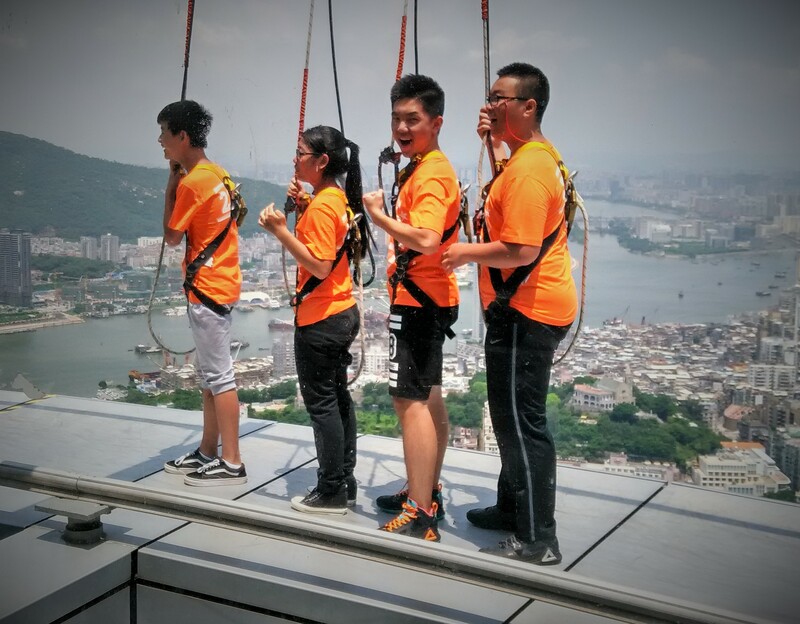 Macau is a great bungy destination and here you are jumping from a modern architectural marvel – Macau tower – that is right in the middle of a dazzling metropolitan city. And guess what? This is the world’s highest bungy jump. You fall at a speed of 200 km/h from a platform 233 metres high (61st floor) and rebound at 30 metres above ground. Your mind may become numb, your heart may stop beating for a bit and you may have butterflies in your stomach, but it is absolute exhilaration. 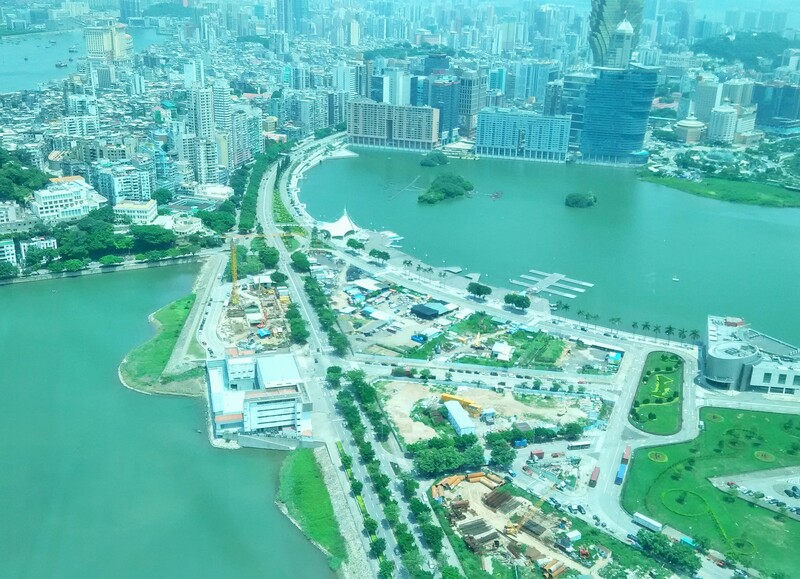 The panoramic view which includes Macau’s historic waterfront, the Pearl River and the Macau peninsula is the cherry on the cake. There’s a reason why this former Portuguese colony is known as the Las Vegas of Asia. You’ll find the biggest, best and the most expensive casinos at the Cotai Strip in Macau and each of them have carved their own niche. The city has more than 30 casinos, of which the Venetian Macau is the largest. It is modeled after its sister casino resort the Venetian Las Vegas, it’s the seventh-largest building in the world by floor area. 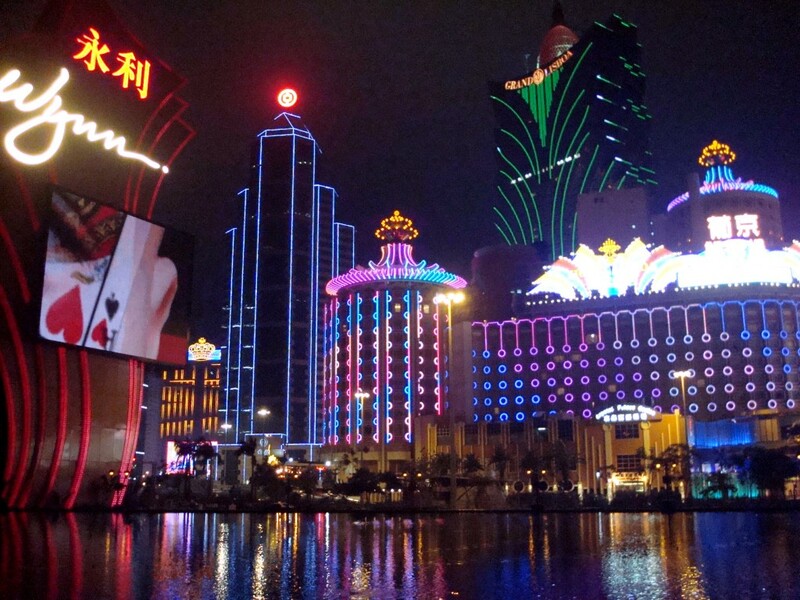 The party never stops in Macau, thanks to its 24-hour gambling and entertainment scene. Walk through any Macau casino and the vast majority of tables will be baccarat. Macau has its own currency – the pataca, or MOP – but in the casinos the currency of choice is the Hong Kong dollar. Ready to gamble your heart away? The almond cookie specialist caught in action! 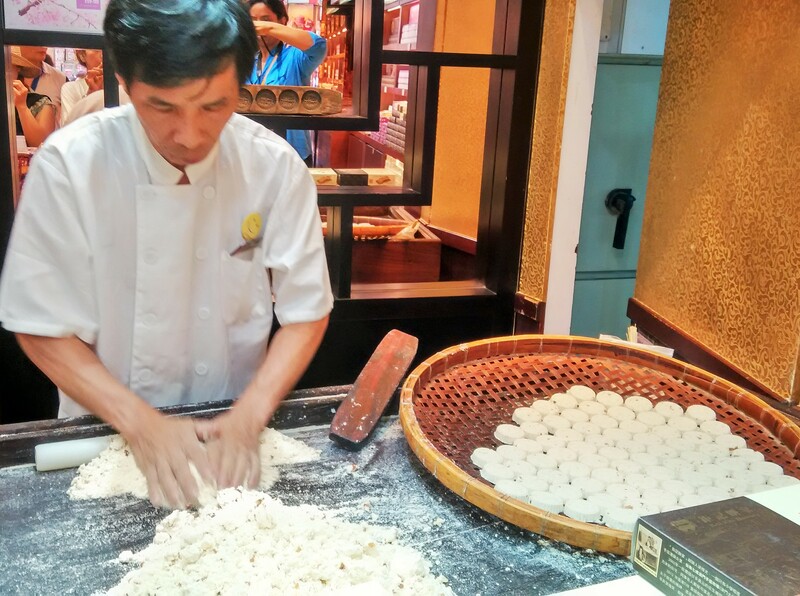 Macanese cuisine evolved when different styles of cooking were infused into traditional Portuguese cooking. Wives of Portuguese sailors based in Macau attempted to replicate European dishes using local ingredients and spices from Africa, India and the coast of Malacca that were available as ships passed through the port. And then, of course, Chinese cooking techniques were integrated into these dishes as well. Pork chop buns (fried boneless pork chop rests inside a tasty white bun) is a Macanese speciality. It is nowhere close to hamburger but delicious in taste. If you have a sweet tooth, you certainly shouldn’t miss out on Serradura (sawdust pudding) – whipped cream and condensed milk layered between crushed tea biscuits. Bakkwa is salty-sweet dried meat that is considered a delicacy in some parts of China. It’s a little softer than jerky due to having a higher moisture content but you can find it all over the streets of Macau. The best part: you can sample it before you buy it. And lastly, when hanging around Ruins of St Pauls, don’t forget to pick up some almond cookies for your loved ones back home! If you’re going to Macau, you can also consider a day trip to Hong Kong. Sit back and enjoy the 60-minute ferry ride and admire the landscapes of both Hong Kong and Macau.